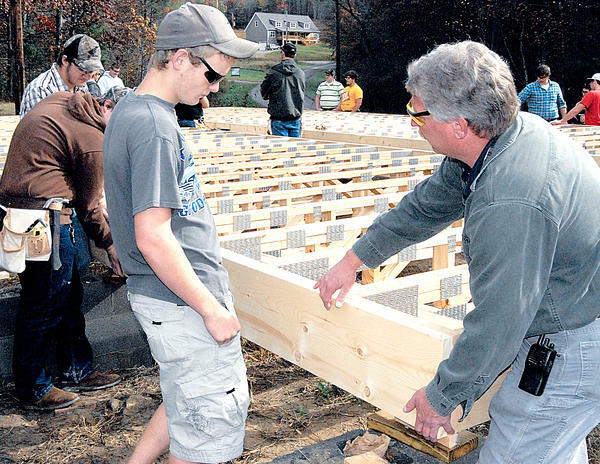 HILLSVILLE, Va. — In just days after getting building permits, Carroll County High School students have nailed and glued a sturdy floor together for the 48-by-24-foot ranch house. 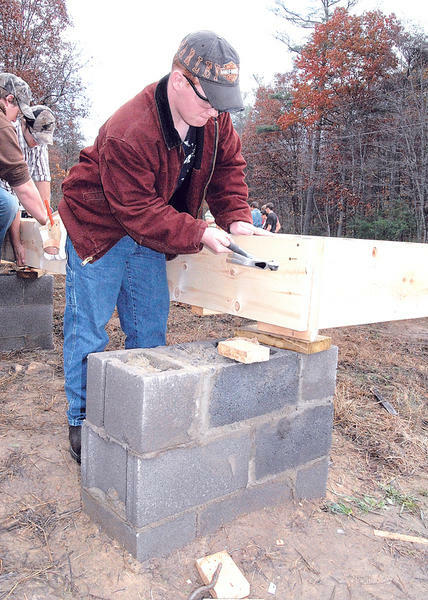 The project will take the youth in the building trades 1 and 2 classes through the particulars of masonry, carpentry, electrical and plumbing, according to teachers and Fuller House organizers Rusty Warren and Vance Leggett. Both participated in the recent announcement of the Greater Carroll County Chapter of the Fuller Center for Housing, under the international organization founded by the same man who created Habitat for Humanity. Construction began behind the high school on masonry piers, with students and teachers taking great care to make sure the floor system would be level, Warren explained. The house will be built in modules, so the finished pieces can be taken up by crane and transported to the final site. Making sure the floors go together just right is the best way to match it up with the foundation at the site, he explained. That gave the students the chance to get experience with using the laser level. Organizers aren’t yet sure where the final site will be, because they haven’t selected the family to participate in the housing effort. "We were very fortunate that Lowe’s is working with Tri-State Components," Warren said. "They donated the floor trusses, and so we’ve got an exceptionally strong floor system." That’s important because the moving crews will wrap two cables around the components and lift them onto and off of a truck, he said. A rigid floor will keep the home from collapsing in on itself when picked up. About 35 building trades 2 students get to do much of the work. Around 50 building trades 1 students contribute in a support capacity. Warren expected the decking to go down on the structure last week, and the students would move on to putting up the walls this week. The teachers intend to take the students through their paces all this school year, installing the plumbing and electrical once the roof is on. There will likely be weekends when they invite the community in to assist with the work. When May rolls around, the teachers want to have the house ready to ship to the site. "Then the community will become the labor force to finish it out." Much learning is happening at the high school in connection with this project, the organizers said. Christie Williams’ drafting class has worked on the floor plans, Richard Slate’s technology class has set up a website, Courtenay Houston’s mass media class is making a documentary on the effort. The culinary arts class has offered support by making foods for the Fuller Center chapter’s events. "It’s much more in-depth than us just pounding in nails," Leggett said. "It also gives us an opportunity to introduce our students to community service," Warren said. Organizers would like to have a family chosen by mid-December. The Fuller House has enough funds to start the project, but it still needs more donations to finish it, Warren said. The Fuller Center chapter work is 100 percent volunteer. Donations may be made to Carroll County’s Fuller Center here. Community members have many ways to get involved in the project, Leggett noted. Sponsoring a room or suggesting a family to help are just two of the possibilities. Learn more about the Fuller Center of Carroll County. Want to organize a group of students to build? Check out our Student Builders program.